Please let us know if you intend coming along and don’t forget to check the website as close to the event as possible. The Town Hall management do their very best to ensure our tours take place, but this is a working building. 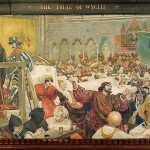 The next full, detailed tour of the Ford Madox Brown Murals in Manchester Town Hall is scheduled to take place on August Bank Holiday Monday (31 Aug 2015). This is going to be a de-luxe offering, for we will be starting at Manchester Art Gallery at 11am to examine the Pre-Raphaelite paintings in detail. There will then be a coffee break in the Art Gallery cafe before we head over to the Town Hall. 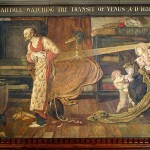 This the only tour examining the Murals in forensic detail, the commentary crafted by Ed Glinert and John Alker after capturing from the London Library the last remaining copies of the massive volumes devoted to Ford Madox Brown. This has been a labour of love, so join us for an entertaining and illuminating commentary about the paintings, why those subjects were chosen, what they mean, and not least of all who all the characters painted on them are.